I'm helping the team at Colour Me....! to celebrate their one year anniversary. 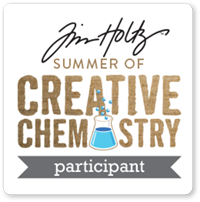 I was lucky enough to be a guest designer in June this year, and I'm delighted to have been asked back for this special event. I've chosen the colours from Challenge #43. 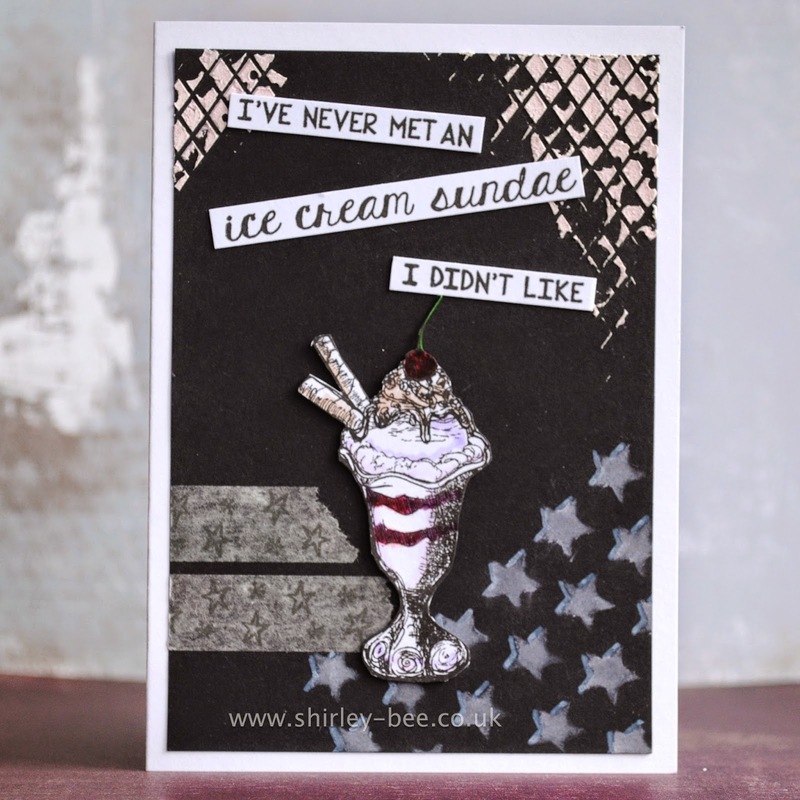 The background panel was already made and lying in my stash, and it just so happened to have two of the colours, black and cantaloupe, so it just remained to make a dark cherry ice cream sundae! The stamps are from the STAMPlorations Sugar Rush set. 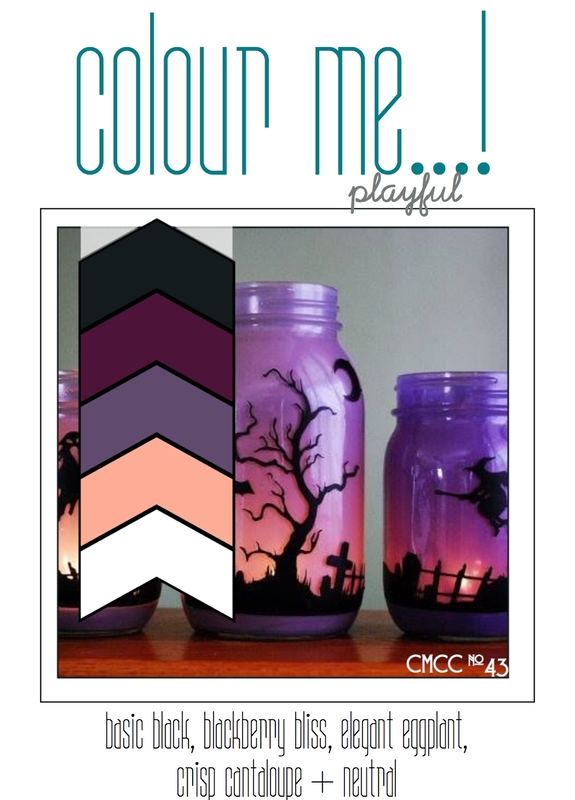 Pop on over to the Colour Me....! 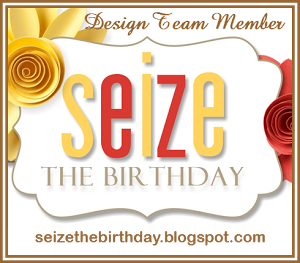 blog to see the fabulous inspiration from the team and other guest designers, and join in the celebrations! 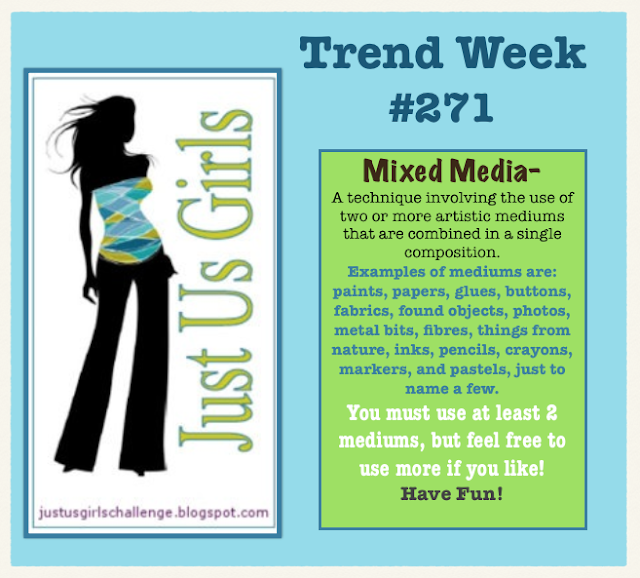 I'm rather taken with the current Inkspirational Challenge, and CityGirl seems to like it too! I used patterned paper to make a new coat for her, and gave her some knee-length boots with a little detail. 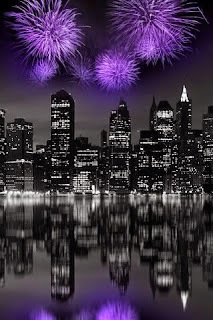 This time I've gone for purple sequins to represent the firework bursts. Popping in with a quick card that I made for a couple of challenges. The background is embossed and gold-foiled wrapping paper, which is far too nice to wrap presents in, so I used a piece for the starry sky background. 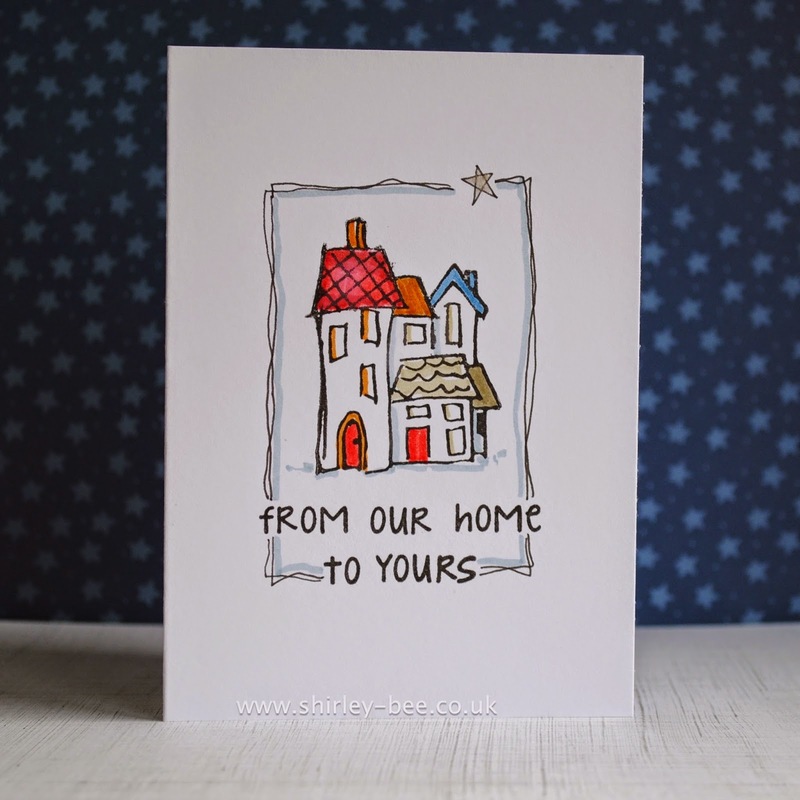 I stamped and masked the houses image across a piece of card, added a sentiment then fussy cut the top edge and layered it onto the background. 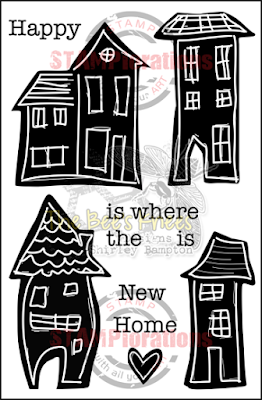 The sentiment is from STAMPlorations Holiday Artsy, and the The Bee's Knees - Houses stamp set will be available in January from STAMPlorations. Here's a little reminder card for you. I brayered some pink acrylic paints onto white mixed media card, then stencilled some dots with translucent pink and white. I added bottle ring marks using a bottle top and white acrylic paint. The folk hearts are punched out from double-sided patterned paper. I scribbled heart shapes with black pen and added highlights with white pen. 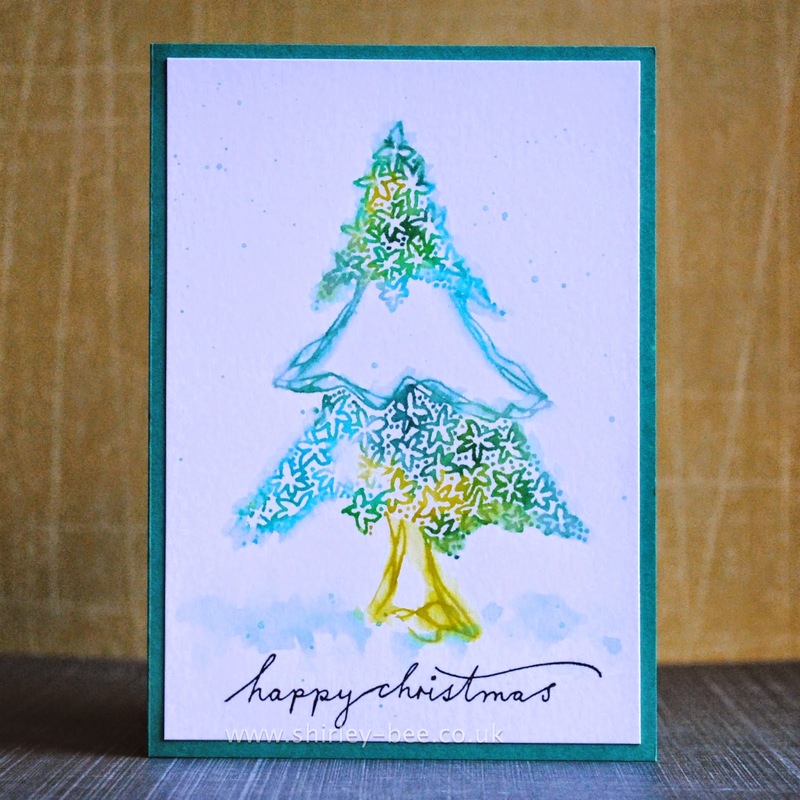 The tree base is made from strips of black card dotted with white pen, and the tree base is the only stamping on the card. The black dots on the background were made with a zigzag craft scraper thingy, and I outlined some of the hearts with Caran d'Ache crayons. 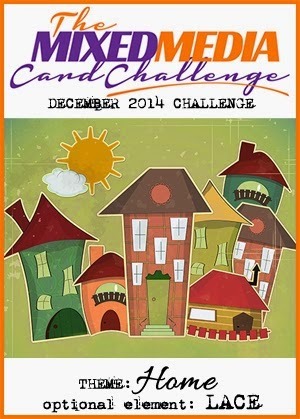 Hope you can find the time to join in the challenge! I'll be entering this into Simon Says Work It Wednesday - Love! CityGirl is being one of Santa's helpers tonight. I made this one at the same time as the previous SantaGirl, and this time I backed it with some pink snowflake paper which has been in my stash forever. 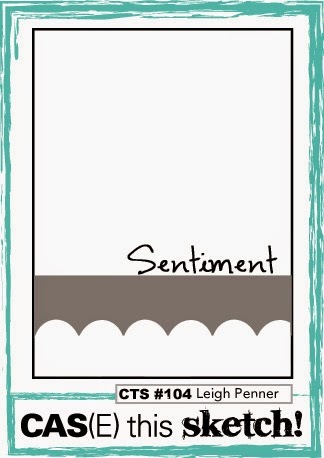 The die-cut sentiment is from Simon Says Stamp, with a tiny self-adhesive ab gem instead of a dot for the 'i'. 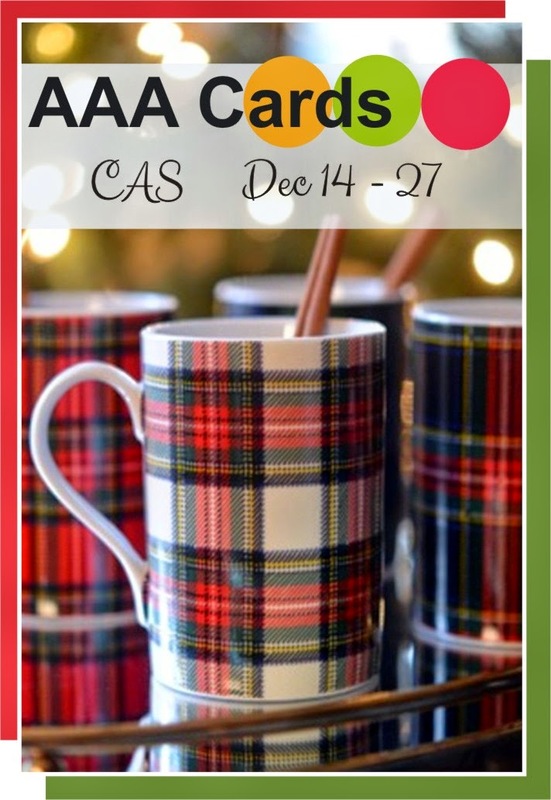 I'm entering this into CAS on Sunday - Christmas. I'm back tomorrow with a Christmas tree with a difference. 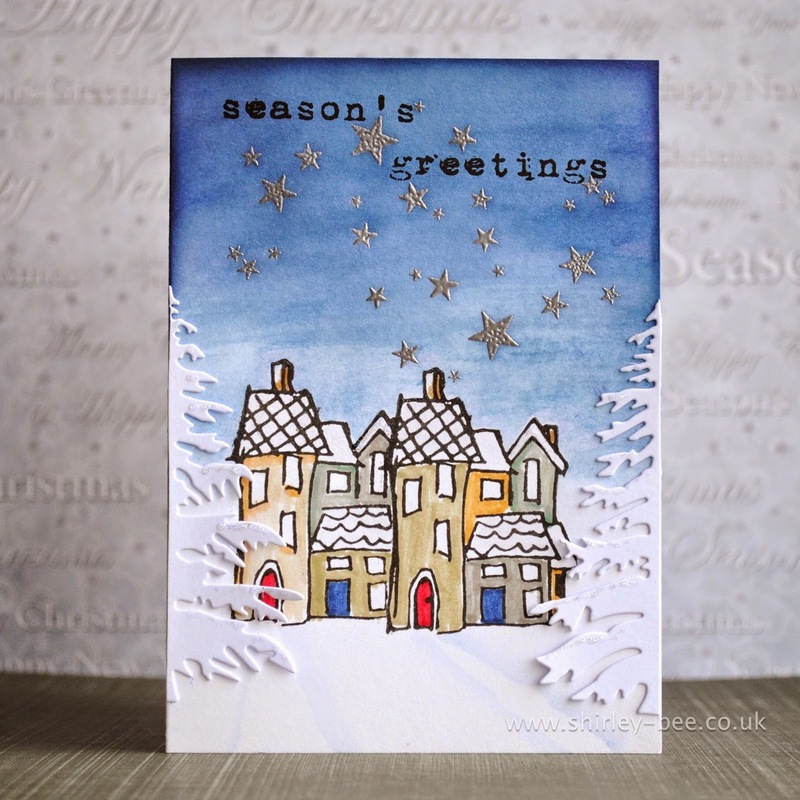 The Mixed Media Card Challenge is well underway, and this month's theme is home, with an optional element of lace. 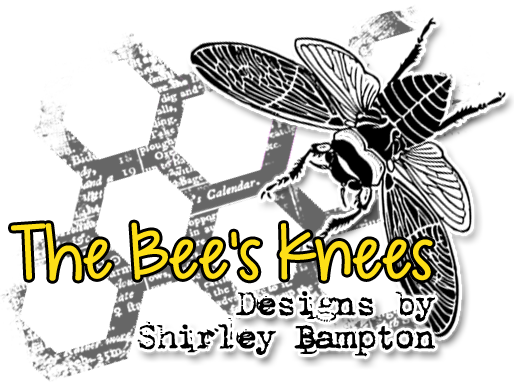 I used a stamp that I designed earlier this year, which will be available in 2015. 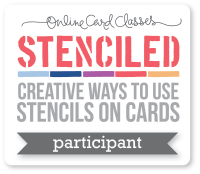 The background is Distress Inks, overstamped with Versamark and silver-embossed. The roofs have been washed with Wink of Stella and the eaves with Stickles, although neither show up in the photo. 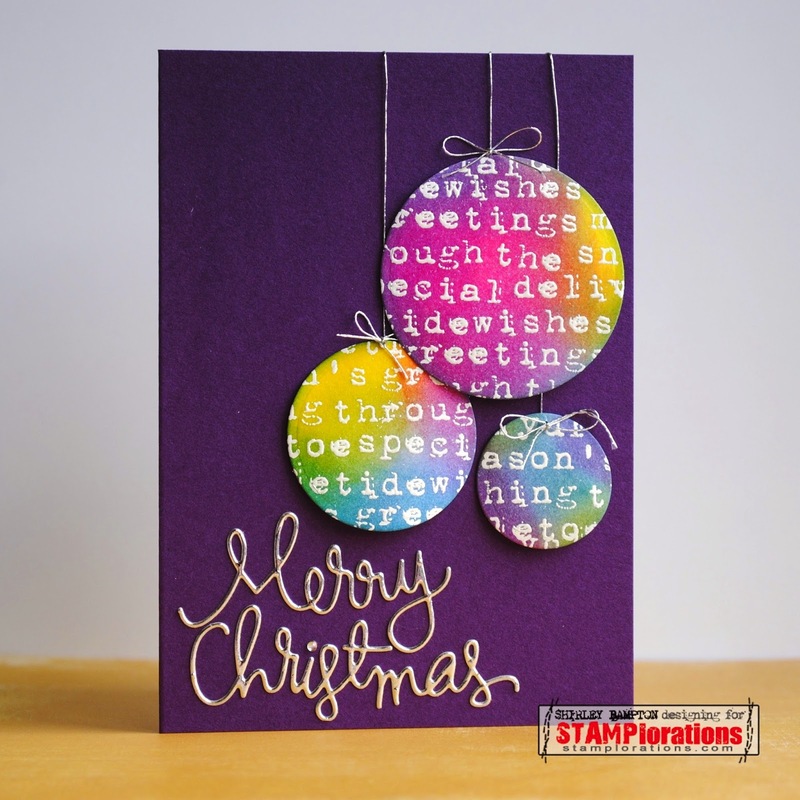 I added dimension with a diecut tree chopped in half and affixed them to either side of the card and topped the branches with a little more Stickles. The sentiment is from STAMPlorations. 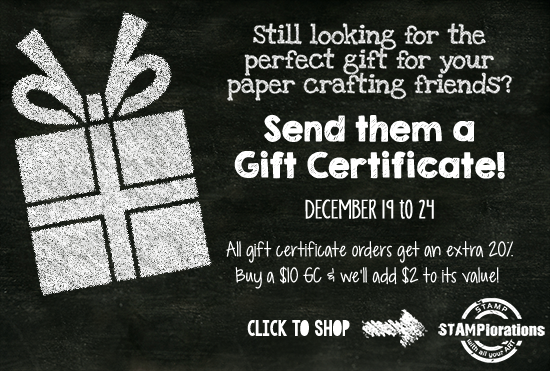 And if you're stuck for what to buy your crafty friends for Christmas, how about a STAMPlorations gift certificate? 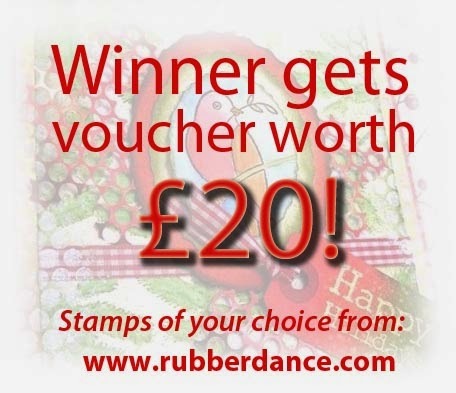 Order before 24 December and you get an extra 20% on your value. 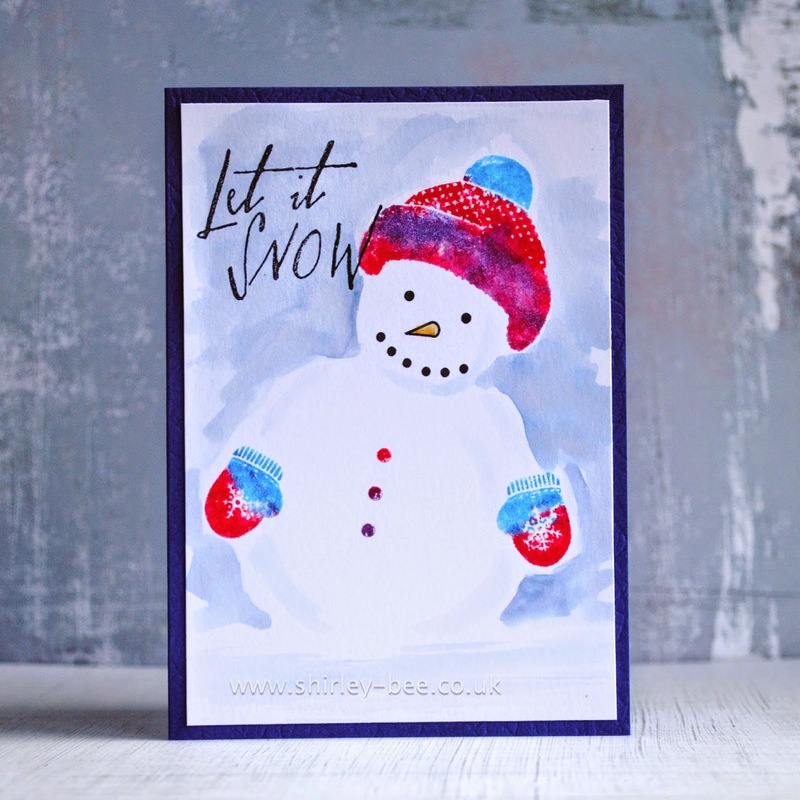 A quick post from me before this snowman melts (we're still having unseasonably mild weather). I pencilled in a body and a head, then stamped the face with Versafine Onyx Black, stamped the hat, gloves and buttons with spritzed Distress Inks, then painted in the background and erased the pencil lines. Busy day for me today. If you're looking for my Time Out guest designer post, click here. 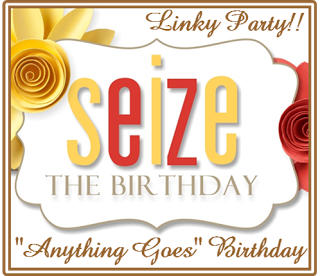 If you're looking for my Seize The Birthday post, click here. If you're just browsing, carry on! I'm over at STAMPlorations tonight with a tutorial on how I made this card using a technique from the last millennium. Click here to take a look. It was hard to think birthday with silver and gold at this time of year, everything I thought of was Christmassy, so that's why I went minimalist. 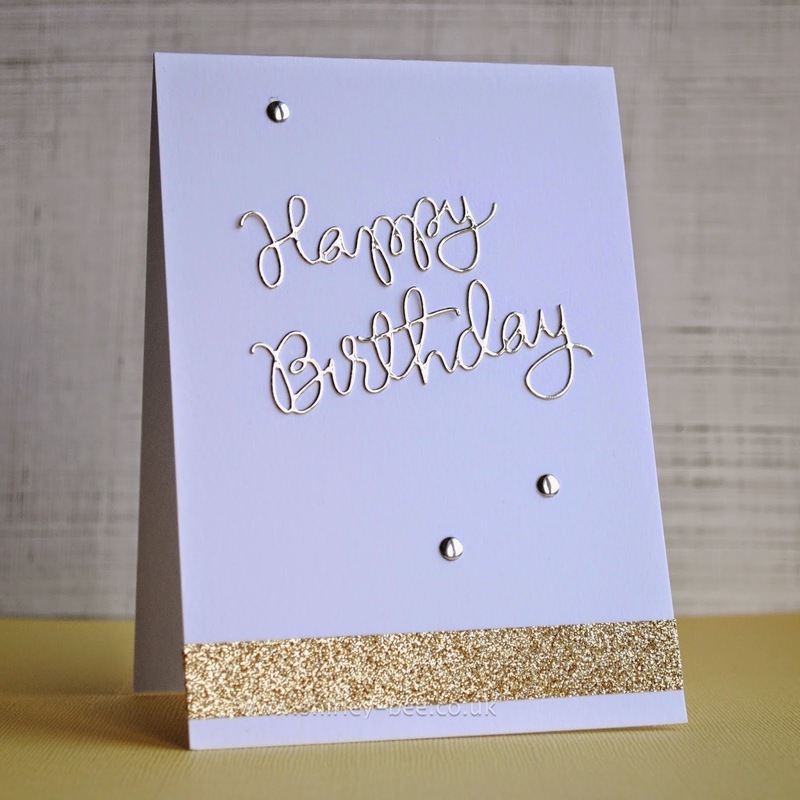 If you're struggling with silver and gold for a birthday, don't worry - you can still join us with any birthday card. But take a look at the design team's fabulous inspiration first. I've used a gorgeous Magenta stamp that I've had for years, and coloured the image with Distress Inks. I sponged Old Paper through a doily stencil, then inked the burlap stencil with Tea Dye and used it as a stamp. The sentiment is from Simon Says Stamp. 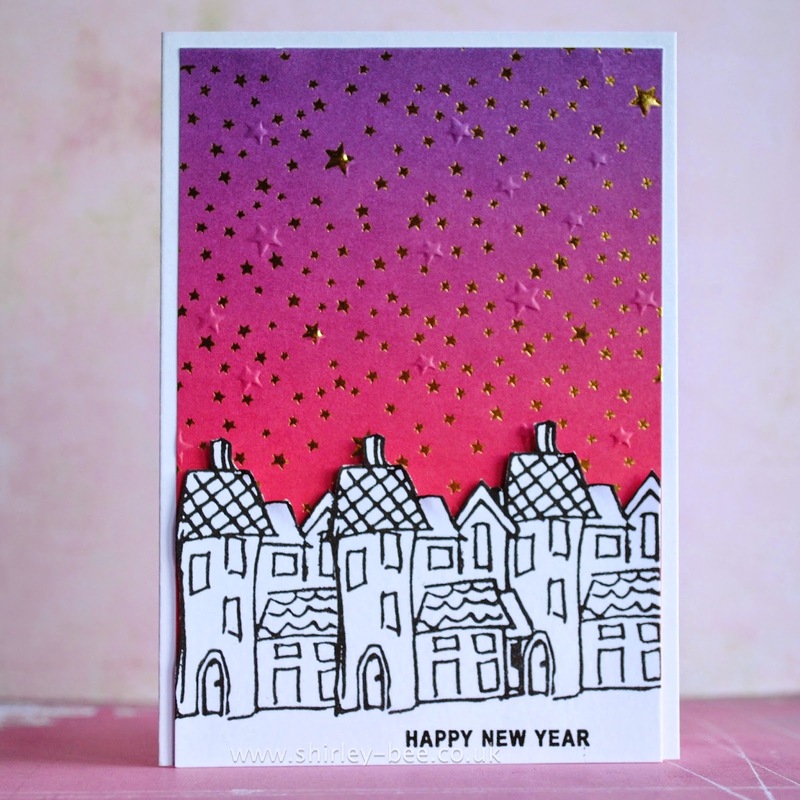 Pop on over to the Time Out blog to see the fabulous inspiration from the design team, and join in - I'm sure you've got a Christmas card or two up your sleeve. I'm entering my card into Simon Says Monday Challenge, Anything Goes. She's back again! This time she's looking to buy a Christmas Tree, although she doesn't look particularly interested in any of them. Must be all that dazzling snow putting her off. 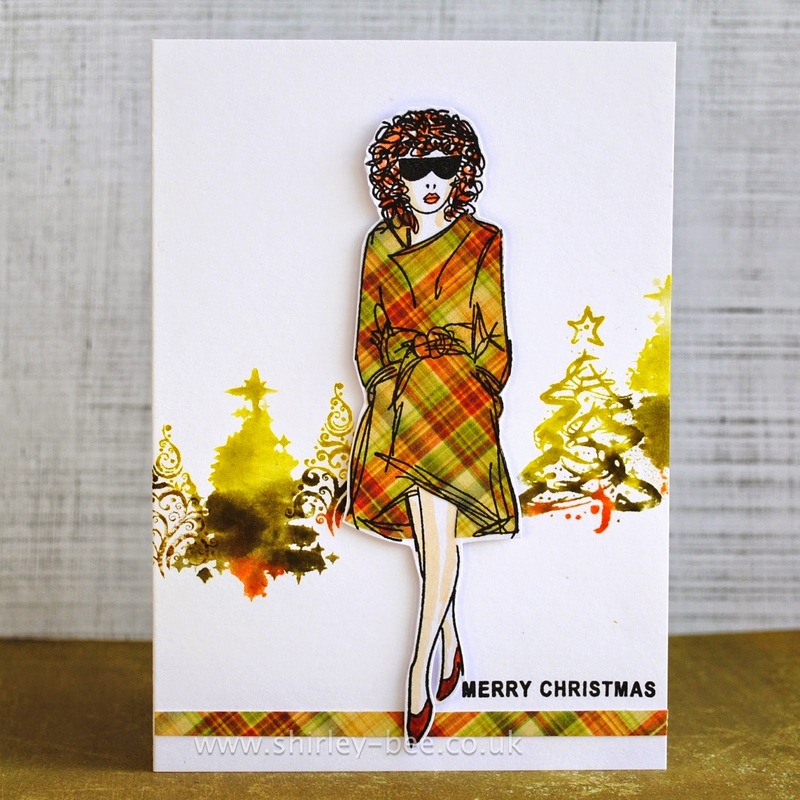 I stamped the CityGirl image onto white card, and again onto plaid patterned paper. I cut out the coat and paper-pieced it onto the image, and fussy cut. I drew some shoes on her and coloured them with Distress Inks. I inked up the trees with Distress Inks, spritzed and stamped, then cut a strip of matching plaid to ground the image and added the sentiment from the Holiday Artsy set. I've been having a play with mixed media, seeing as my kids have now sorted out my birthday present - a year-long online art/mixed media/journalling course. The journalling part is optional, so I'll probably be opting out of that bit, but who knows? 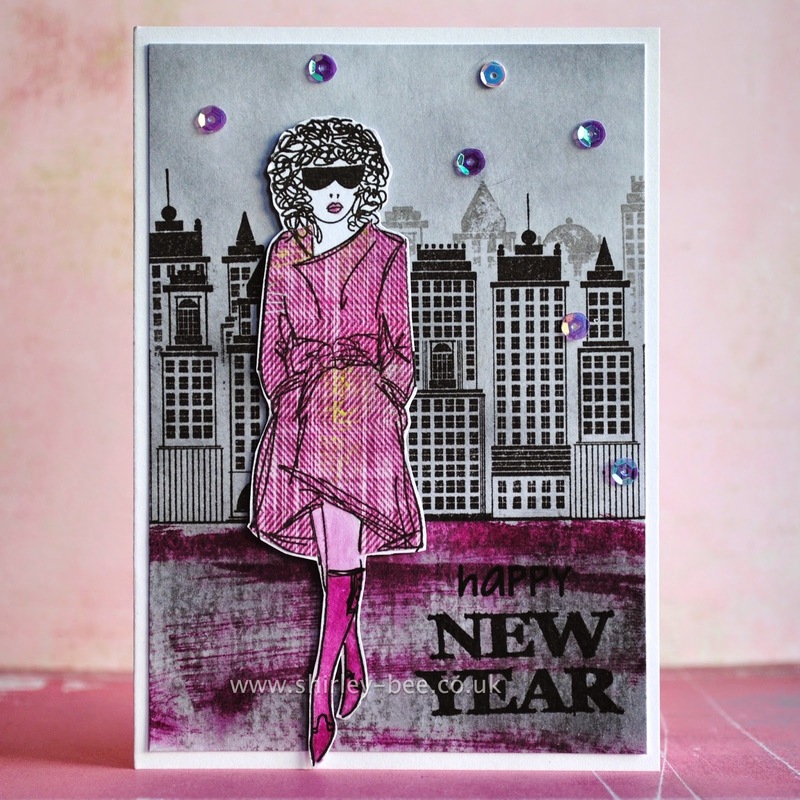 For this card, I tore pieces of patterned paper from my ginormous, never-decreasing stash and stuck them down onto white card, then stamped the CityGirl image, aligning it to get the best from the papers. Then I painted over the background with white acrylic paint to soften the colours, and left the papers within the image unpainted so that they were more vibrant. I stencilled some dots using translucent cerise paint, then again with white acrylic. There was a cut-out folk heart lying around on the desk shouting at me, so I drew a heart border and added it to the card. 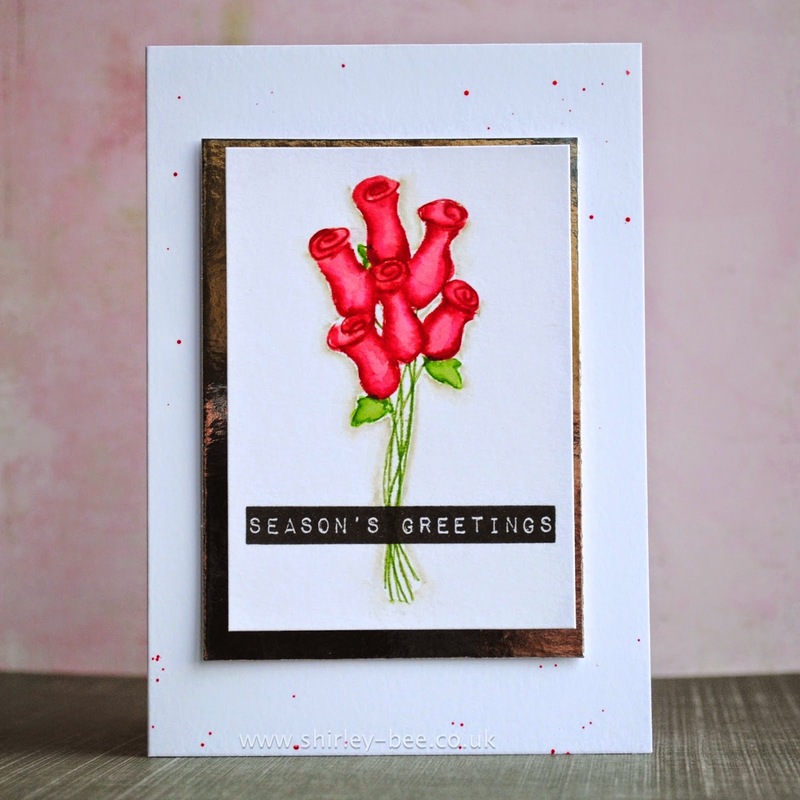 I wanted to make a Christmas card with my Rosebud stamps, so I wanted it to be stylish, elegant and dramatic. Bit of a black tie do. As it happens, the challenge at The Paper Players is Black Tie: Holiday Projects that are Fancy. Maybe not too fancy, but definitely posh enough for Black Tie. I inked the image in Old Paper Distress Ink, then painted it with Festive Berries and Mowed Lawn. I added a bit of Antique Linen around the edges of the image, then offset-mounted it onto silver mirri card, and then onto a splattered card base. 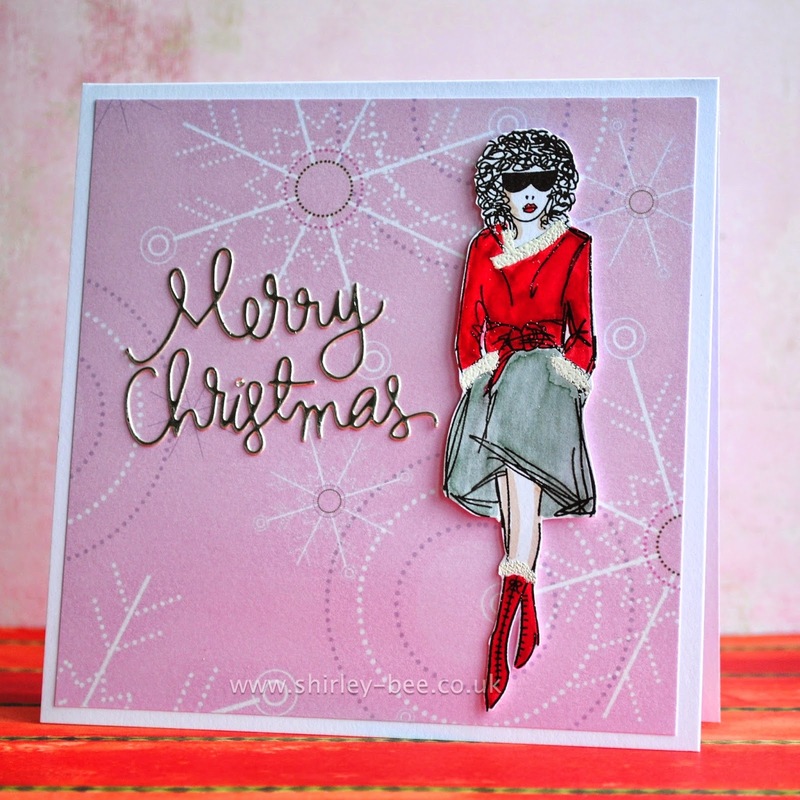 The sentiment is from Oh, Christmas Tree - I love the Dymo style sentiments. 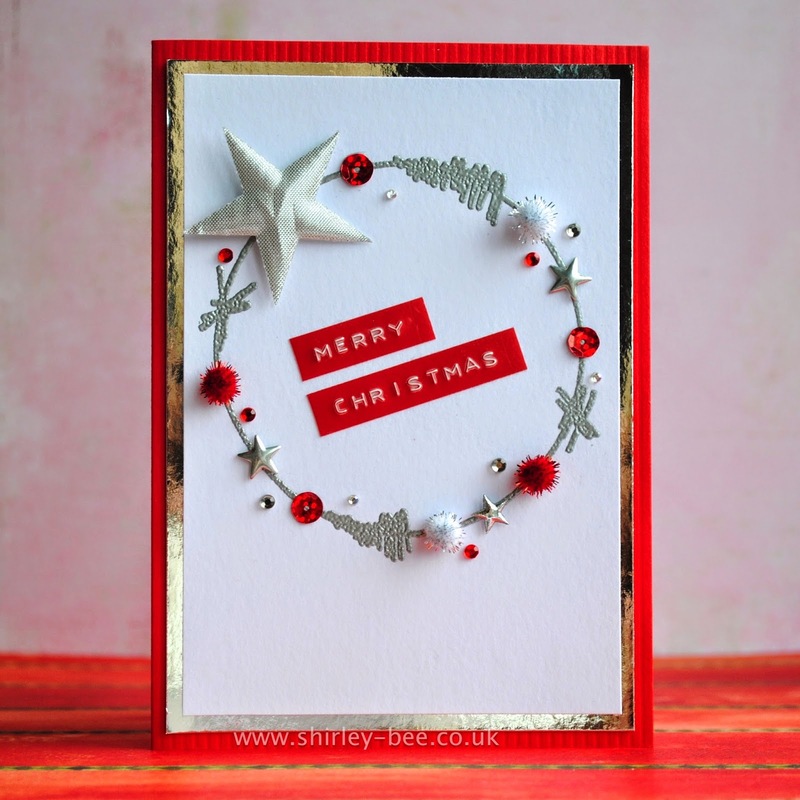 I am honoured to be one of the guest designers for The Twelve Projects of Christmas, hosted by A Sprinkle of Imagination. There are some seriously gifted crafters in this line-up, so I'm thrilled to have been invited. 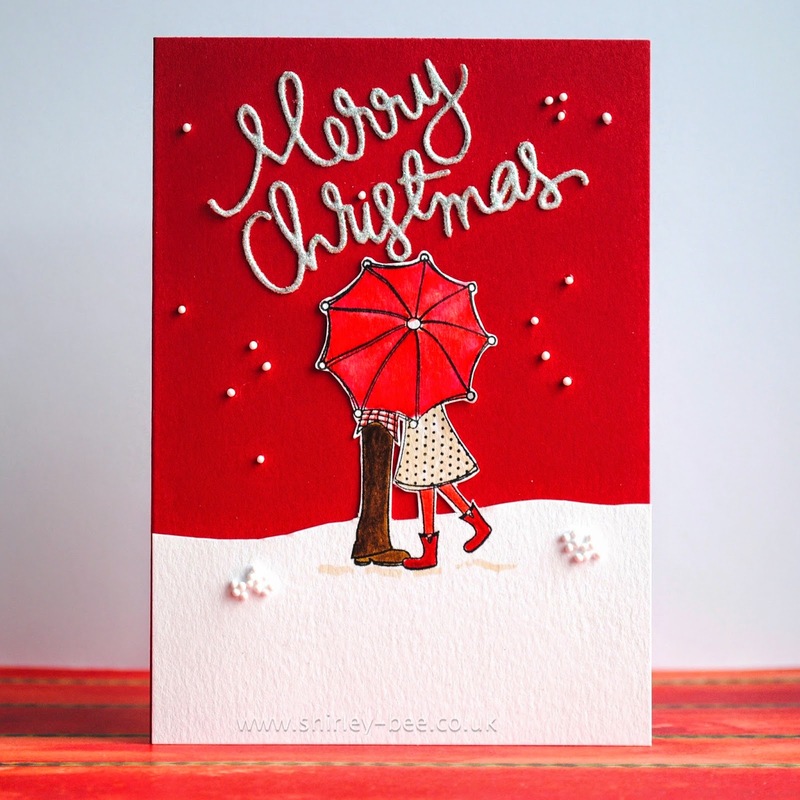 For my card, I stamped the image onto white card with Versafine Onyx Black, then squished some Distress Inks (Festive Berries, Barn Door) onto an acrylic block and used them as watercolours to slosh layers of colour over the dress and shoes. 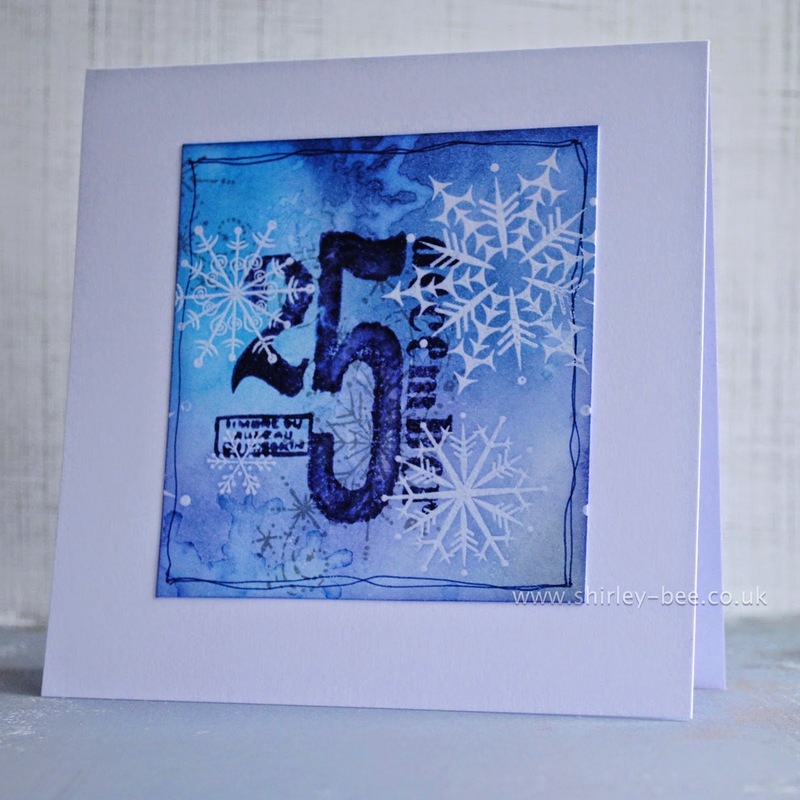 I washed some of the colour onto another piece of card, then stencilled HO HO HO with Black Soot Distress Ink and cut the words into squares, and drew a border with white gel pen. I added some white embossing powder to the dress hem and collar. 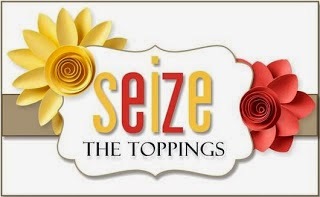 The background text is partially stamped in Versafine Smoky Grey and a text stamp. Here's a close-up. 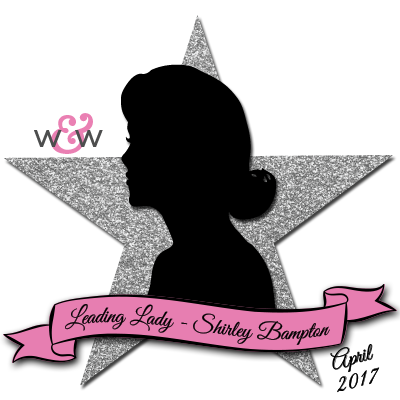 If you leave a comment on all twelve of the guest designers' blog posts, you will be in with a chance of winning a fabulous goodie box. What are you waiting for? Here's another version of the barbed wire wreath, this time with sparkly red and white pom-poms, a satin star and lots of gems. The wreath is silver-embossed, the sentiment is Dymo tape, and the white panel is matted up on to silver mirri card then on to ribbed card. I'm entering this into Simon Says Wednesday Challenge, Bling It On. I'm over at STAMPlorations later tonight using up leftovers from this card. Pop over to see what I did with them. 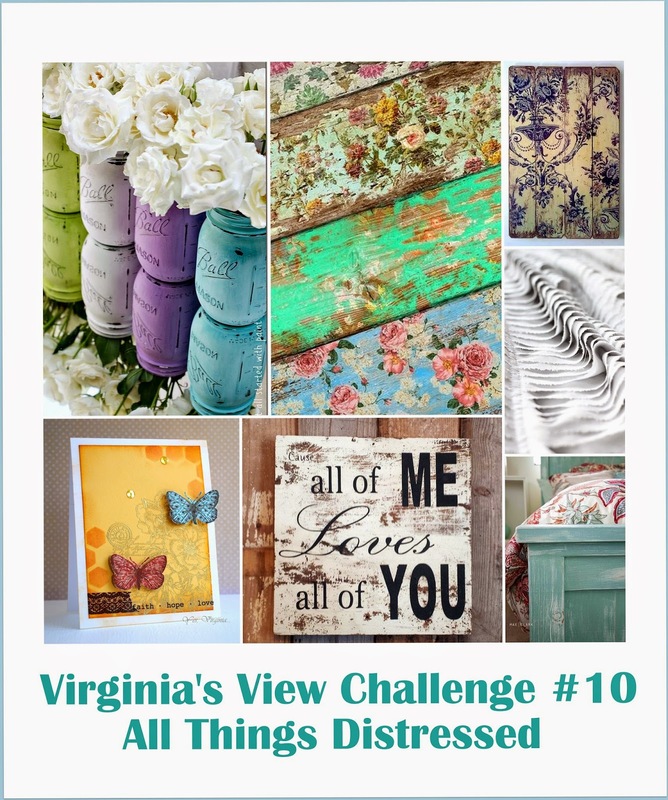 I'm playing along at Virginia's View, where the challenge is All Things Distressed. How could I refuse? 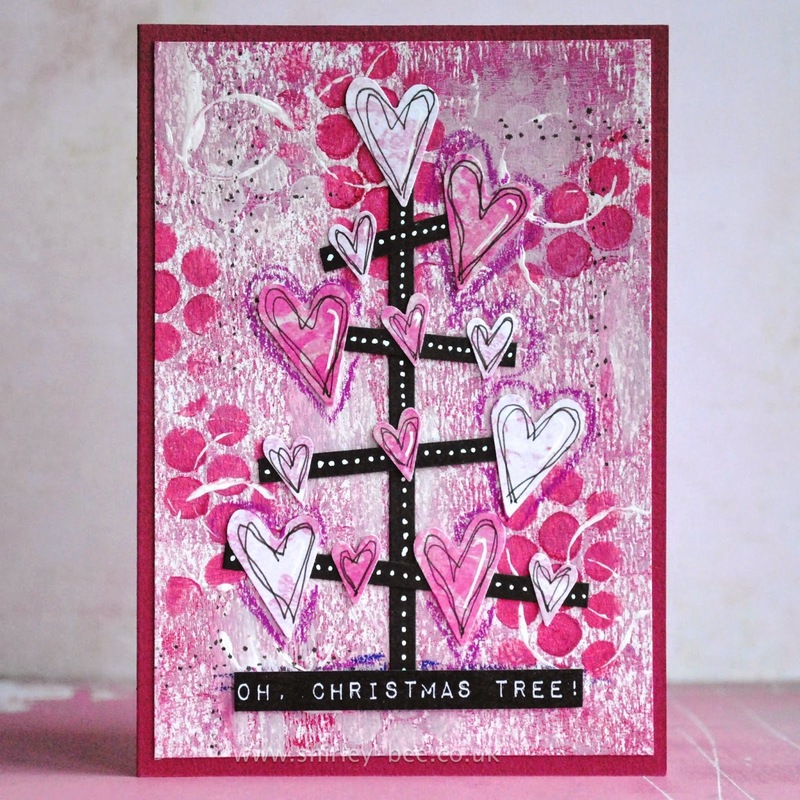 I inked my favourite Magenta Christmas tree stamp with Distress Inks, spritzed and stamped. I dabbed a wet paintbrush around the edges of the image to soften the lines, and along the base of the tree to ground it, and added the sentiment from Woodware. 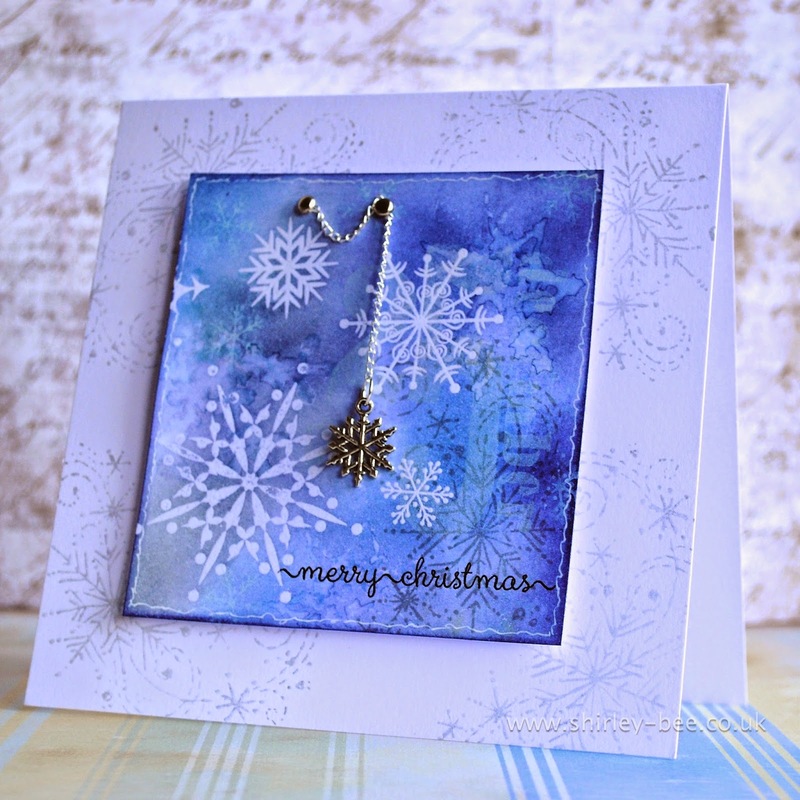 Oh, and I added some splatters, my go-to embellishment! 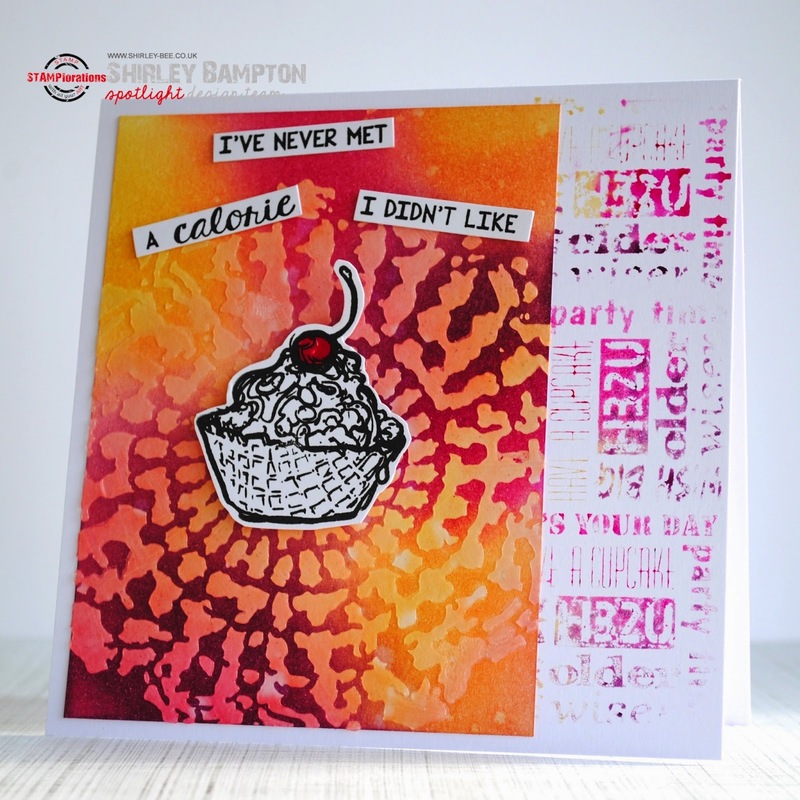 I stamped the image onto mixed media paper, coloured it in, then cut out the top background area. I cut the sentiment in mirri card, then ran it through my X-Cut and covered it with fine glitter. I added some snow for dimension.